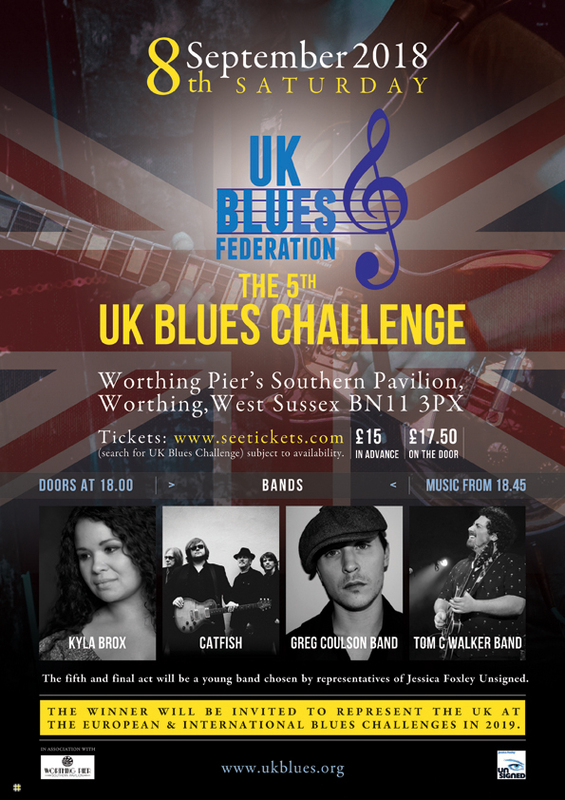 The UK Blues Challenge 2018 will take place on Saturday 8th September 2018 at Worthing Pier’s Southern Pavilion doors at 18.00 pm and the first band will play there Challenge set at 18.45 pm. Once again, there will be the opportunity to hear five super blues band play. This year the bands entertaining us as they play for a chance to represent the U.K. at the 35th International Blues Challenge in Memphis in January 2019 & 9th European Blues Challenge in Ponta Delgada in the Azores in April 2019. Sit back enjoy the music from five bands who interpret the Blues in their own ways. Greg Coulson, Kyla Brox, Catfish, Tom C. Walker and Carl North & The Lonely Hearts. There will be a panel of handpicked judges who will do the thinking and cast the votes that will select the band that will be representing the United Kingdom in USA & Europe in 2019. They are facing a challenge as these bands know how to deliver the Blues with, originality, superb vocal and instrumental prowess, stage presence that captures your attention and blues of every shade. How were the bands selected for the UKBlues Federation Challenges? Four of the bands who had the most nominations from a panel of over 600 people have been announced for the 5th UKBlues Challenge. they are Kyla Brox, Greg Coulson Band, Tom C. Walker and Catfish. A fifth act will join them and this act will be chosen by the Jessica Foxley Unsigned Project panel from those acts appearing under the Project’s banner at this year’s Great British R’n’B Festival at Colne in late August. 2018 saw Carl North & The Lonely Hearts, conquer the Jessica Foxley unsigned stage. This is an evening where five bands celebrate the power of Blues in Britain – Tickets are now on sale they are hotter than the summer sun… so dash over to See Tickets and get yours reserved!